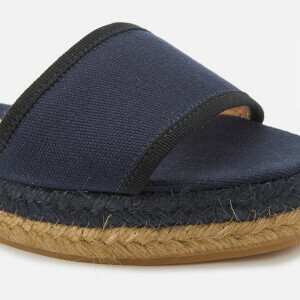 Women's espadrille sandals from Castañer. Crafted with durable canvas uppers to form a two strap design, the 'Worquidea' sandals feature a strap across the toes and curved strap to the heel with self-tie, wrap-around ankle strap. Set upon a two-tone, braided jute outsole with rubber sole for grip. Upper: Canvas. Lining: Calfskin. Sole: Jute/Rubber.